But none of these measures provide an indication of how much of the physical warehouse (space) has been covered. 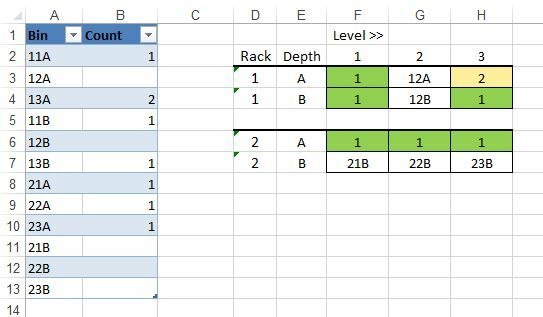 Use Excel’s VLOOKUP function – and Conditional Formatting – to set up the simple visualization below (Figure 2, query data in column A and B). (At least one) StockCode in Bin ’11A’ has been counted once. I used Conditional formatting to show these Bins as ‘green’ or ‘ok’. Level 2 of Rack 1 has not been counted yet – or these bins are empty. (At least one) StockCode in Bin ’13A’ has been counted twice. This is handy if you’d like to see if a Bin was ‘double checked’ or if everything has to be double counted (e.g. two separate teams). 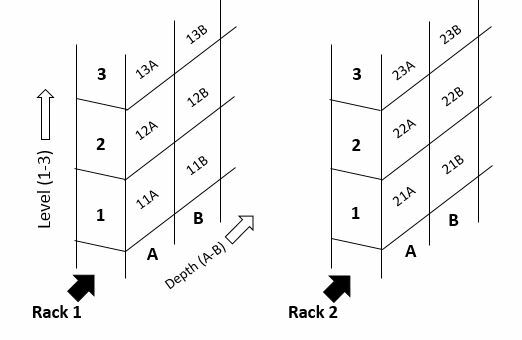 ‘Column’ or Depth ‘B’ of Rack 2 has not been counted – or the whole ‘Column’ in Rack 2 is empty. I recently wrote a report for a customer with Average costing switched ON, so there were no dated lots/batches to use in the aging. I made the assumption that FIFO was used. I first calculated the receipts (POs, Jobs, Adjustments and Stock Receipts) quantities and values for the last 3, 6, 9, 12 (etc.) months, at Actual Costs (from InvMovements). I then systematically calculated backward from the InvWarehouse.QtyOnHand, by deducting each period’s receipts, until InvWarehouse.QtyOnHand was ‘depleted’. The remaining periods’ receipts were then cleared/zeroed. Let me know if you need assistance with something similar. Herewith a list of the most commonly used Pastel Partner Table names, a short description of each and the corresponding file name. Let me know if you need to link these or do a custom Pastel report from them! Pastel custom reports – easy! Feb 20,2012 Comments Off on Pastel custom reports – easy! An accountant friend of mine asked me to do a ‘Monthly Product Sales’ for his client working on Pastel Partner. I’ve never seen Pastel’s database layout before – but picked it up very quickly using the ‘Pervasive SQL Control Centre’. Within an hour I could show the (customer) their monthly sales (by units and/or values – for the last two years) in an Excel Pivot table – with the customer and/or product in the filters. The nice thing about using Excel’s Pivot tables – is that one can easily ‘drill down’ to invoice line level. We could immediately pick up where/when exchange rate calculations were skewd by misplaced decimal points.. The accountant was quite delighted to find out that the same report can be used on any of his clients’ Pastel databases. Let me know if you require any Pastel custom reports (in Excel or on the web).